Warmly welcomed by our Airport representative, you will be introduced to your dedicated chauffeur for the tour, to be transferred to your first stay in the fishing village of Negombo. If the time permits and if you would like to explore the history of the dynamic city, you will be taken on a brief tour to see Dutch churches or for a boat ride along Dutch canals. 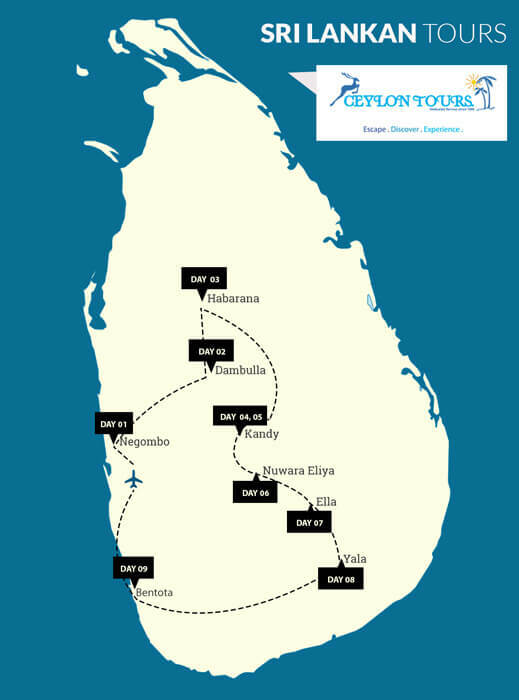 The tour begins by leaving for Dambulla to explore the famous Golden Rock cave temple which has been declared a UNESCO World Heritage Site. Recognised as a sacred pilgrimage site for 22 centuries, this cave monastery, a vast isolated rock mass with its five caverns is the largest best preserved cave-temple complex in Sri Lanka. The Buddhist mural paintings (covering an area of 2,100 sq. metres) are of particular importance as are the 157 statues including a 47 foot long statue of the recumbent Buddha. Afterward leave for Sigiriya. Climb the rock fortress of Sigiriya - a 5th Century "Fortress in the Sky". Built by King Kassapa the fortress was a Royal Citadel for more than 18 years. The lion rock (A UNESCO WORLD HERITAGE SITE) is a citadel of unusual beauty, rising 200 metres from the scrub jungle. The base of the rock is ringed by a moat and rampart and extensive gardens including the renowned water gardens. The majestic Lion’s Paw picturesquely guards the stairway of the palace on the summit. See the famous frescoes of the “Heavenly maidens” of Sigiriya in a sheltered pocket of the rock and the 10 foot high Mirror Wall. After the climb, head for Habarana, a silent peaceful village with fine accommodation options which are located facing green topographies of the village. Check in at your hotel on arrival, and spend the rest of the evening at leisure. Later continue on to one of the ruins of ancient Ceylon - the UNESCO World Heritage City of Polonnaruwa, which was the Capital of Sri Lanka from the 11th to 13th century. Polonnaruwa was a well-planned medieval city defended by enclosing walls (around 5 km. which still remain), graced by palaces, shrines, monasteries, pavilions, parks, ponds and irrigation lakes. Polonnaruwa is strewn with ruins in a resplendent state of preservation. The ‘Gal Vihara’ which consists of statues of the recumbent, standing and seated Buddha have been cut from a single granite wall and rank among few of the true masterpieces of Sri Lankan Art. After Breakfast head to Kandy. En route you will visit a spice garden in Matale. You will check in at your hotel on arrival and once you are rested, continue on to your tour of Kandy! Kandy, the beautiful hill country capital is a UNESCO World Heritage Site, which is famous for the Temple of the Tooth which houses the most sacred religious relic, the tooth of the Buddha. The Kandy Lake built in 1807 and the Peradeniya Botanical Gardens, are some of the key jewels of the town that elevate its magnificence. After breakfast leave for Kitulgala a small town perched on the hills that slope down to the flowing waters of the Kelani River. The main attractions include white water rafting, trekking and the Kelani Forest Reserve a popular bird watching location. Enjoy a thrilling day of white water rafting. Afterwards leave for the beautiful town of Nuwara Eliya, set in the heart of Tea country and situated 1890 meters above sea level, is where the British succeeded in creating an English countryside with homes in styles from Georgian to Queen Anne. After an early breakfast at the hotel, leave for Horton plains, the highest plateau in the country. It is one of the very important National parks in Sri Lanka especially for its topographical variations. It has unique vegetation and is famous for many rare and endemic highland birds. The most awesome fascinating feature of the Horton Plains is the escarpment that falls 880 meters to the lowlands of the southern region of the island. Aptly known as the ‘World’s End’ the view from the precipice of the countryside below towards the south coast is spectacular. Return to Nuwara Eliya upon completion, and at your convenience commence a sightseeing tour of the city. Visit the Nuwara Eliya Town, Market place, Golf Course, (one of the finest 18 holes Golf courses in Asia) the Hill club, and drive around this hill station viewing Lake Gregory. After breakfast leave for Ella. A little village surrounded by high mountains and breath-taking vistas in the central hills of the country. It is famous for the Ella Gap – a gap in the mountains where you can see all the way up to the ocean. It is also a base for plenty of trekking expeditions to the surrounding countryside and offers plenty of beautiful scenery and waterfalls. After an early breakfast, commence a jeep safari in the Yala National Park by private jeep accompanied by a tracker. Yala National park is one of Sri Lanka’s premier eco tourist destinations and is renowned for its variety of wildlife notably for Elephants and Sri Lankan Leopards. It is also home to the Spotted Deer, Sambar, Wild Buffalo, Sloth Bear, Jackal, Mongoose and Crocodiles. The Peacock is easily the most famous of the birds in this park. Yala has a high concentration of Leopards although seeing these nocturnal carnivores still requires some luck. Afterwards leave for Galle, the capital of the southern province is a city with a colourful history. Being a UNESCO declared World Heritage Site; the magnificent Dutch Fort is the most popular attraction of the town. 300 year old Dutch atmosphere is still very much alive around the Fort, undisturbed by the modern skyscrapers. The southern coastal belt is the most popular among the tourists and comes to life mainly from October through April when the monsoon moves northeast and the sea becomes calm with blue skies. The City of Galle had been the earliest European administrative centre of Sri Lanka until the British shifted the port to Colombo. Bentota delightfully located along one of the finest beaches on the South West coast. Spend the day at leisure watching the waves as they bounce off the sun-kissed sands. Overnight Stay : Hotel in Bentota.